Crew Resource Management Training (CRM) encompasses a wide range of knowledge, skills and attitudes including communication and focuses on the non - technical skills of both Flight and Cabin Crew. Our interactive and engaging CRM training course includes relevant and thought provoking case studies and study of events. The three yearly cycle of the CRM training program covers all the required modules in-depth over a rolling three year period and complies with the EASA requirements and structure for CRM training delivery. 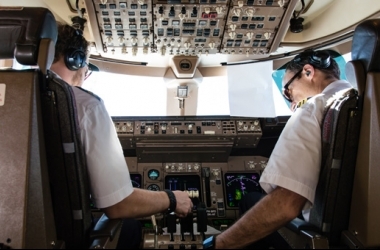 CRM training makes optimum use of all available resources, equipment, procedures and people - to promote safety and enhance the efficiency of flight operations, by reducing error, avoiding stress and increasing efficiency. The three yearly cycle of the CRM training program covers all the required modules in-depth over a rolling three year period. The recurrent modules include the latest module EASA subject additions, startle and surprise, resilience, monitoring and intervention and cultural differences. The combined course the course is for both Cabin Crew and Pilots and includes interactive relevant case studies. Identification and mangement of the passenger human factors: Crowd control, passenger stress, conflict management, medical factors. As per a third party training organisation we are permitted to provide the training in accordance with ORO.GEN.205. In the case of contracted CRM training, the content of the course covers the specific culture, the type of operations and the associated procedures of the operator for in house training . When crew members from different operators attend the open ground school course, the CRM training will be specific to the relevant corporate aircraft operators and to the trainees concerned.